After a massive fire ripped through a family-owned greenhouse complex in Laval early Tuesday, firefighters called in excavators to demolish the smouldering remains of two industrial buildings. Black, billowing smoke rose into the air at dawn Tuesday as the two buildings were engulfed in flames. The smoke reached Highway 13, reducing visibility for morning commuters. It could be seen as far away as Pierrefonds and people in the Plateau-Mont-Royal borough reported smelling the smoke. Fire officials say the smoke was not toxic. 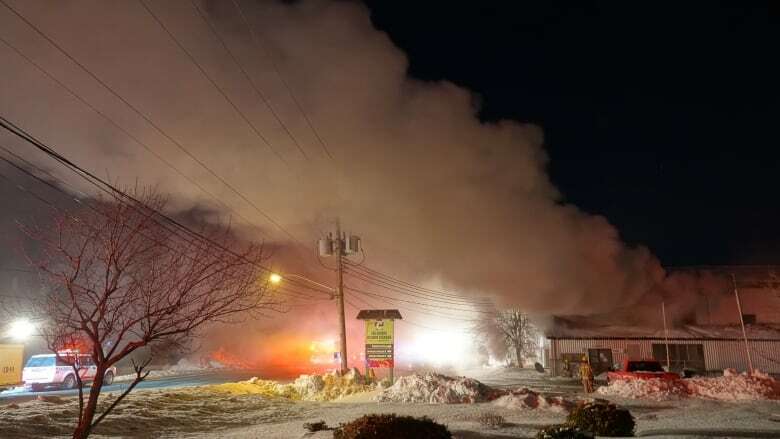 The fire broke out around 4 a.m. at Serres Sylvain Cleroux Inc., located on Principale Street just south of Highway 148. The business was closed when the fire started and there was no one inside. 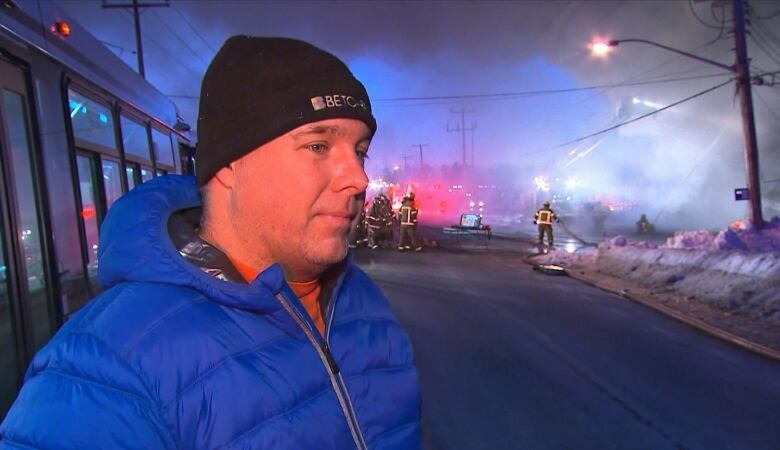 Jean-Sebastien Roch, a division chief with the fire department, said no one was injured. He said about 50 firefighters were called to the scene and they are taking a defensive approach because they feared the roof could collapse. The fire was made worse by high winds and several propane tanks inside the buildings. Eventually, at least one roof did collapse as the fire completely destroyed the two buildings and continued to burn well into the morning. Some four hours into the fire, firefighters could still not enter the buildings and were forced to attack the fire from the outside. By noon, firefighters were able to get the fire under control, preventing its spread. Equipment and surrounding buildings were coated in thick layers of ice after fire crews sprayed the site in water. Roch said it is too early to know how the fire started. Radio-Canada is reporting the main furnace, which provided heat to the entire complex, was destroyed in the fire. The company recently planted its newest crop and crews were scrambling to get the heat up and running again or face a loss of up to $3 million in plants alone. There were also administrative offices, computers, files and some farm equipment destroyed in the fire. The complex employs some 200 workers, many from Mexico and Guatemala. It is unclear if the workers will keep their jobs. The fire department asked Hydro-Québec to cut power to the area for safety reasons, he said, leaving about 1,700 customers without power throughout the morning. 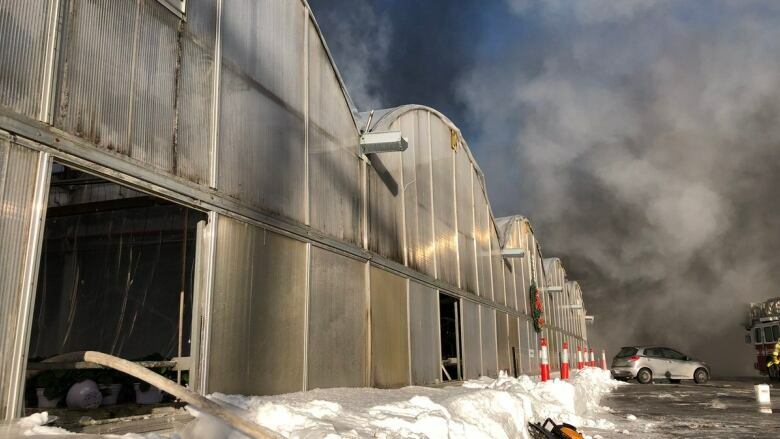 Robert Ouellette, who lives near the greenhouse complex, told Radio-Canada he woke up as the fire started. "At about 4:30 there were several explosions in a row over about five to 10 minutes," he said. "I went outside to see what was going on." 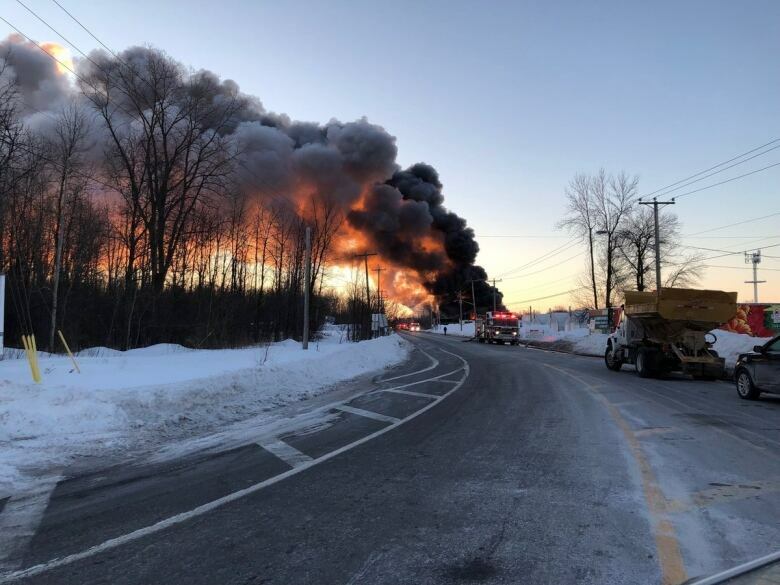 Firefighters suspect propane tanks may have exploded. It's unfortunate, Oullette said, to see the long-standing business go up in flames. On its website, the company calls itself the largest flower producer in the province. The business cultivates thousands of flowers every year, distributing them across Canada and the United States. Since 1983, current president Sylvain Cléroux has worked to modernize and expand its facilities, the website says. The company, which also has a Mirabel location, has been passed down through generations of the Cléroux family. Robert Ouellette was woken early Tuesday by the sounds of explosions at the greenhouse complex near his home in Laval.